Compatibility: Requires iOS 4.2 or later. 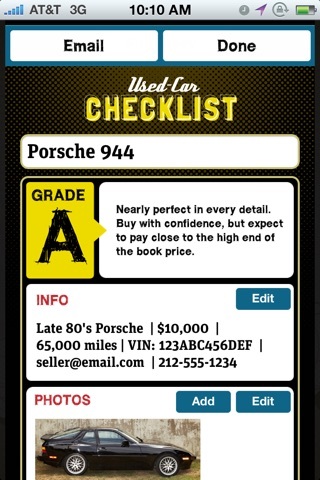 Before you buy a used car, thoroughly inspect it with the help of this 101-point checklist from the automotive pros at Popular Mechanics. It’s fun and easy to use. 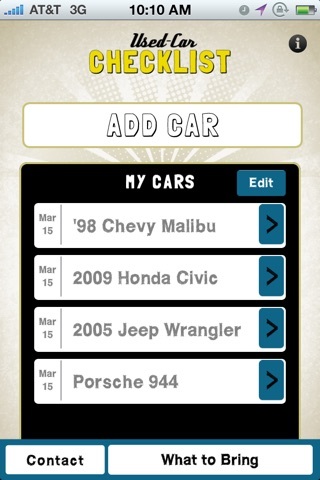 The app keeps track of problems you spot and stores the information for later, along with photos and your own notes. The goal of this app is to get you, the buyer, to see, feel, and, yes, smell the entire car, which will help you judge its condition. Note: While this checklist is rigorous, it’s impossible to predict when mechanical or electrical components will fail. Remember, you can always take the car to a certified mechanic for a second opinion. Features Good for novices as well as experts: Each question requires a simple Yes or No answer. Most require no tools. Letter grades (A through F) are updated after every question. Add photos and notes. The checklist is divided into eight sections: Basics, Exterior, Interior, Underbody, Engine, Engine Advanced, Powertrain, and Test Drive. Email your vehicle summary to a friend or trusted mechanic for a second opinion. Within each section, questions are ranked from highest priority to lowest priority. 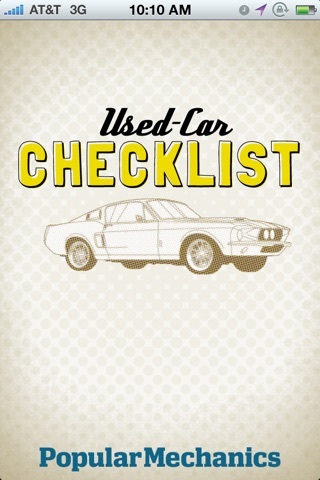 See used-car shopping tips and a list of what to bring for an inspection. You will receive warnings if you answer Yes to the highest priority questions, called Deal Breakers. I hate the Mobil Ad instead that impulse to buy I hate this brand I cant never enter the application I hope the app must be great !!!! Get Rid Of MOBILE 1 Ad, NOW!!!! I was able to use the app, but encountered mobile 1 Oil ad often. Had to power my iPhone off then on in order to get pass mobile oil ad- frustrating. Also, when trying to email my reports , the app crashes. But for the mobile1 oil ad and the email glitches, this app would easily receive 5 stars. However, today it gets (1) one star, based solely on the intuitiveness of the app, and not its functionality. Cannot get past the Mobil ad. Waste of time. Well it opens on a picture of Mobil One and then if you touch the picture it takes you to their Mobil website. Hurray for Mobil. Now to find a good checklist somewhere after I first delete this unprogram! It wouldn't allow zero stars so I had to give it one. My wifi is fine. Couldn't get past the Mobil One Ad. And why is that ad the first action of the program? I am really angry. 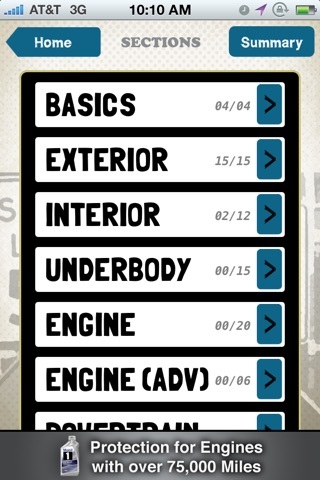 App just ad for motor oil. Nada about used car assessment. Brings up ad for mobil one oil. Cannot access the app!